So this month I went for one of my favourite styles as my BurdaStyle Influencer project, the Flared Culottes. I find anything with a wide leg is so flattering! It adds height and minimises the waist, especially when it is made with a high waist. This particular style sits lower on the hips rather than the mid to high waist, which is my preference. So before beginning anything I had to remedy that waistline. I’m sure it would look amazing in its original design on most people, but my mummy tummy is not friends with a low waistline! First I measured from the top of the waist, down the grain line 6.5 cm (I have no idea why I chose this measurement, but it worked!). I folded down the waist from the 6.5 cm point, matching the drawn grain line. I made a fold line and then opened it back up and ruled along the fold line. This indicates where to cut the pattern. Then I cut the pattern along the drawn line. Next I laid a piece of tracing paper under the pattern and set the 2 pieces of pattern 5 cm apart ( you can alter this measurement for a higher or lower waistline) and ensured that the grainline was still straight by laying a ruler along it. Then I used a ruler to draw in new lines to connect the pattern pieces. Finally, I cut away the excess tracing paper and I sewed the pattern pieces together. I repeated this for all parts of the pattern that contributed to the waistline. Easy as that, you now have a high waist! Keep in mind that when raising the waistline, you are moving the waist from a larger part of your body to a smaller part of your body. This means you will need to bring the waist in also. 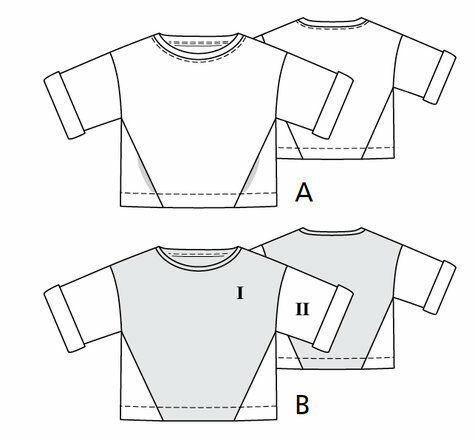 I chose to do this while sewing rather than on the pattern, but you could just as easily remove or decrease the seam allowance starting from the point where you altered the pattern, tapering in, up toward the waistline. So here is my first completed pair of Flared Culottes, which I extended the length of the leg to create, Flared Pants! I didn’t bring in the waist as much as I would have liked to, so these are sitting a little lower than I’d like. Check out the awesome side detail on that flared leg! I loved the flare on these pants soooo much that, naturally, I had to take it a little further and have a bit of a HACK! I imagined these culottes as a light flowy pair of pants that could almost be mistaken for a skirt. How could I achieve that… What if i added the flare detail from the outside leg to the inner leg aswell?? It reminded me a bit of the way that the Flared Godet Skirt was constructed, but for pants! On piece 21 (front leg), lay the front outer leg flare seam line 1 along the inner leg seam line and ensure the leg notches match. Place a piece of tracing paper over the top and trace the same leg flare shape, but at the crotch, follow the original front leg crotch line. Do the same on the back leg with the back outer leg flare. It should look like this and you should now have 2 new inner leg flares. Now you need to remove the crotch you just created on your new pattern pieces from the original pattern. Otherwise you’ll end up with a massive funky looking crotch area! So place your original flare under your leg pattern piece, with leg notches matching. Draw a line from the edge of the flare at the crotch, down the leg. Add seam allowance to this and draw that line also. See the two red lines running down the leg. This will now accommodate the crotch for the inner flare piece. Do the same on the front leg to accommodate the front inner flare piece. Now you simply sew together the inner flare pieces in the same way that you sewed together the outer flare pieces. If you like my top, you can also find that pattern over at BurdaStyle. It’s the Knotted Bodysuit. Follow me to see what pattern I choose for August and how I hack it! August 13, 2017 .Reading time 7 minutes.